Clockwise from left: Mod Palm is a hand-cut jewel glass mosaic designed by Joni Vanderslice for the Broad Street collection by New Ravenna; Living Wall, a waterjet mosaic, shown in shades of green Serenity glass, is part of the Broad Street collection by New Ravenna; Orchid Dimensional, designed by Michael Aram for Artistic Tile, radiates with the graceful charm of delicate orchid flowers; Magnolia Buds, shown in arctic white, brushed brass, and onyx, is part of the French Quarter collection by Mosaïque Surface. With a new year comes a time of reflection, personal growth, and renewed energy. Some of us might also be looking forward to freshening up our homes to create an atmosphere that embodies the spirit of our goals. We love the aura cast by these creative mosaic tile patterns found at Q Tile in Grayton Beach, Florida. 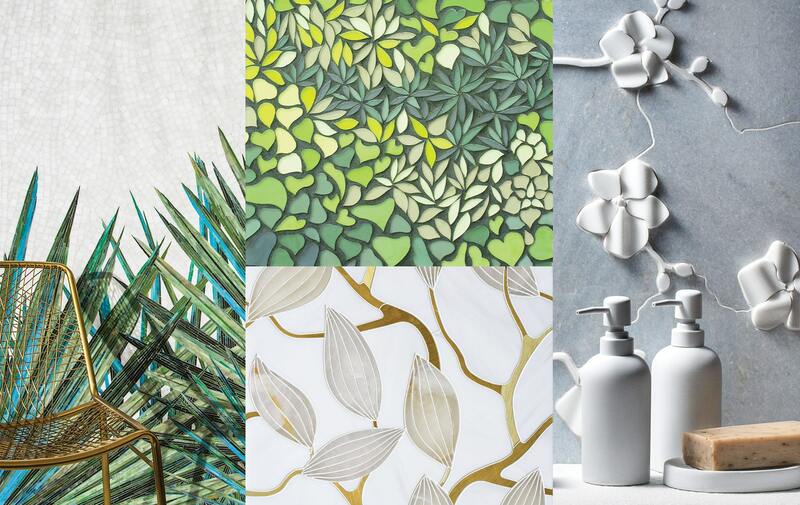 Redoing your bathroom, kitchen, meditation area, or outdoor living space with these nature-inspired looks is sure to bring you a sense of rejuvenation. It’s been proven that a connection to nature can provide both physical and mental health benefits. Why not bring that connection into the home? Tile mosaics with leaf or floral patterns are a welcome change from the linear and uniform tiles that were most popular in 2018. The bold colors and unique textures offer an immersive environment in any space. Take a look at some of these beautiful designs and get inspired! Contact the tile experts at Q Tile and freshen up your space this year! Visit Q-Tile.com to see more, contact Q Tile at (850) 213-0000, or visit the showroom at 17 Uptown Grayton Circle in Santa Rosa Beach, Florida.